Peonies are stunningly beautiful, easy to grow, relatively carefree, and adaptable to any garden style. 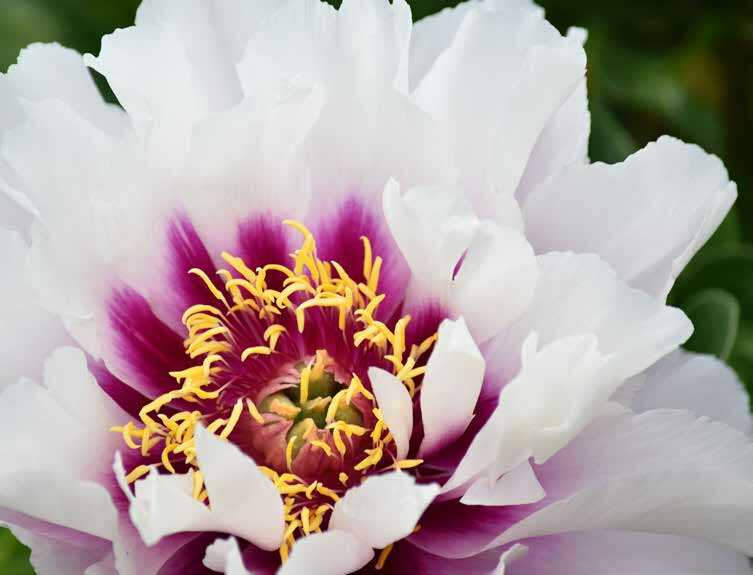 They are a favorite flower everywhere they can be grown and for good reason: the heady fragrances and enchanting colors of a peony-rich garden can evoke memories, capture an enchanted moment, and represent hope, friendship, romance, or gracious hospitality. Wherever winters are cold enough for peonies, gardeners have grown plants that have been shared with them or passed down among generations as treasured living family heirlooms. With their colors, fragrances, and forms, the cut flowers combine well in bouquets. Peonies simply have no rival in their season. Peonies blossom in a wide variety of colors and shapes. Their color range encompasses every tint from pure white through myriad pinks to the deepest reds and rich, complex chocolate tones. Almost every shade is represented except for blue and black, though now some blossoms approach those shades, as with the dazzling deep lavenders of 'Lavender Hill' and 'Sonoma Amethyst'. 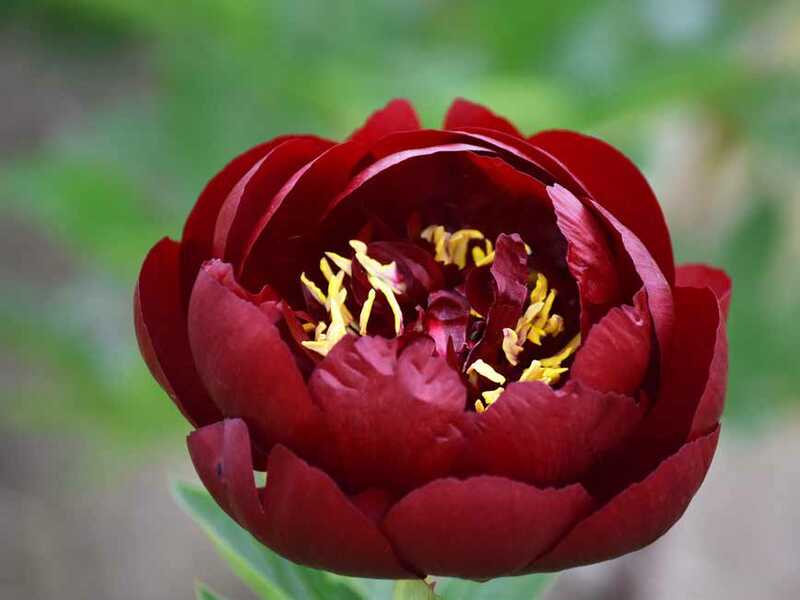 To add to the fun and depending on the cultivar, individual peony flowers may retain the same color from start to finish, or they may begin as one color and either fade or darken to another related color. Some selections are bicolored, and, more rarely seen, tricolored. Contemporary breeders are even providing gardeners with new striped peonies such as 'Candy Stripe'—truly distinctive treasures. The individual flower shapes, which are called forms, can be as simple as a wild rose or so petal-stuffed that it is hard to imagine how all the petals ever fit in the bud, with many variations in between. 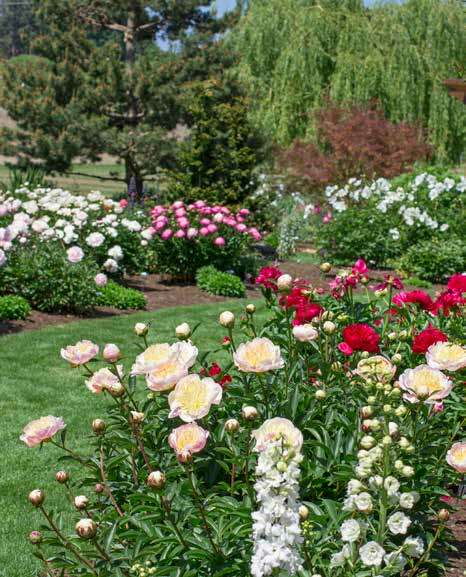 Appreciating and understanding the differences between the three basic types of peonies adds to their versatility in garden compositions and is a big part of the fun of planting these flowers. The three plant types are commonly called bush, tree, and Itoh/intersectional. Each type has its own range of floral seasons and colors, as well as some specialized horticultural needs. The most common type of peony is the herbaceous form, also called bush peony. Members of this group grow each year to the size of small shrubs, bloom in a complete range of whites to reds, and then die to the ground for the winter, resprouting the next spring. Tree peonies are shrubs with distinctively thick woody stems that last for many years. They begin their bloom season earlier than the bush peonies, with the advantage that the flower color covers the same range as the herbaceous peonies and additionally brings in yellow, gold, lavender, and purple to nearly black. The Itoh/intersectional peonies are hybrids between the bush and tree peonies. They were first developed in the mid-twentieth century and they combine the best attributes of both parents. New intersectional hybrids have fantastic colors and abundant floral displays along with the lovely foliage that flows into a pleasingly shaped shrub, making them increasingly popular. The diverse colors and forms make these plants supremely useful for incorporating in all garden styles. Peonies are bold when massed in beds and borders, yet equally stately when integrated among other perennials and shrubs. Peonies are also stunning when used as accent notes in informal plantings. Their roles for garden designers extend well after their bloom season as a backdrop for bright garden colors. Perhaps uniquely among garden perennials, peonies contribute the lush green foliage to the essential summer verdancy that helps such later-blooming perennials as bee balms (Monarda), lilies (Lilium), gladiolus (Gladiolus), phlox (Phlox), and many others become colorful features of their season. For gardeners with a keen color sense, the unheralded colors of peony sprouts as they emerge from the ground provide striking accent notes in spring display beds. Watch the distinctively colored sprouts, described as red asparagus, so you can plan the next year's color scheme for tulips and pansies. Yellow and cream-colored peonies blend with purple iris, mauve dianthus, and salmon-colored lupines. --Taken from Peony: The Best Varieties for Your Garden © Copyright 2017 by David C. Michener and Carol A. Adelman. Published by Timber Press, Portland, OR. Used by permission of the publisher. All rights reserved. Author bio: David C. Michener is associate curator at the University of Michigan Matthaei Botanical Gardens and Nichols Arboretum in Ann Arbor, where he is overseeing the rejuvenation of the Peony Garden, the largest public collection of historic herbaceous peonies in North America. 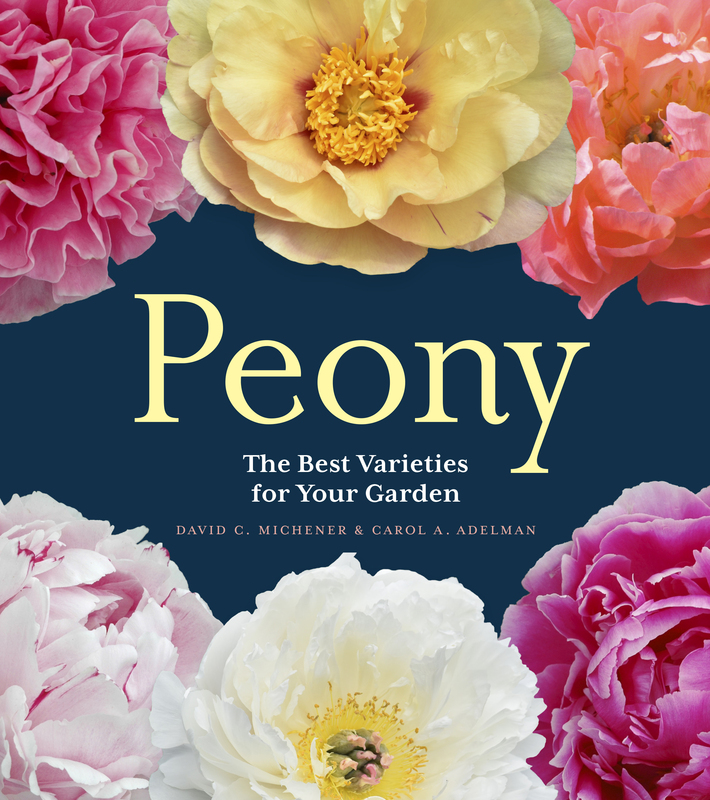 Peony: The Best Varieties for Your Garden is available in hardcover, $27.95 from timberpress.com or online booksellers.